I always love experimenting with new products. 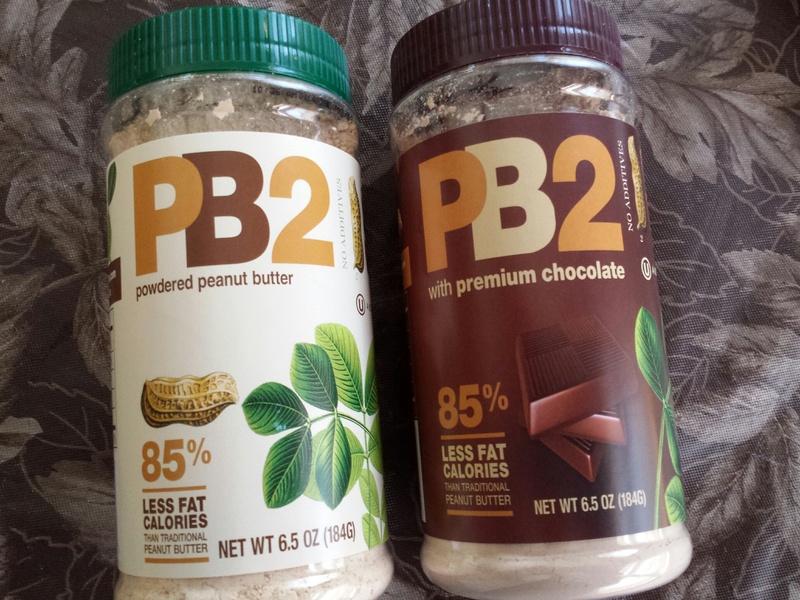 I just found this at Wal-Mart, of all places: Dehydrated Peanut Butter, and Dehydrated Chocolate Peanut Butter. 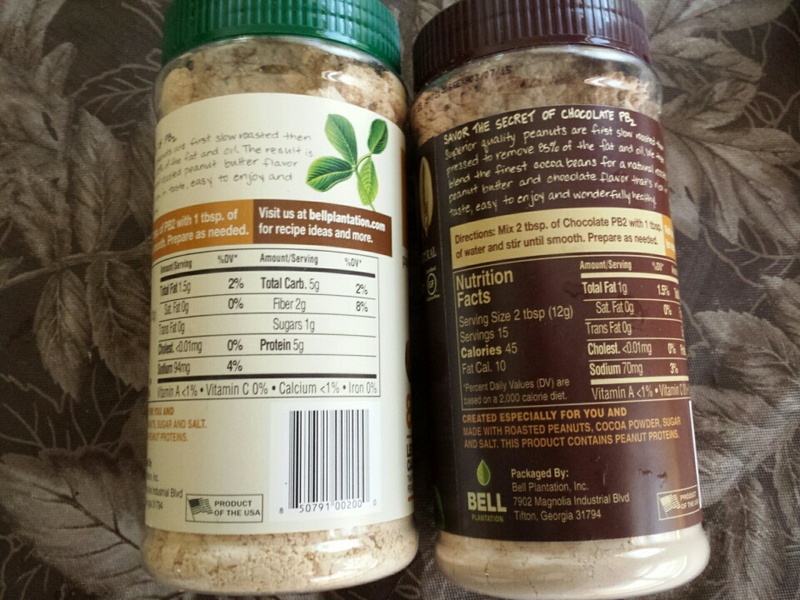 It’s ideal for backpackers going on long hikes who want protein that is light to carry, and it’s good for preppers who keep emergency food supplies in storage. You reconstitute it by adding water, but the serving size is as needed, so you don’t have to make the entire quantity at once. 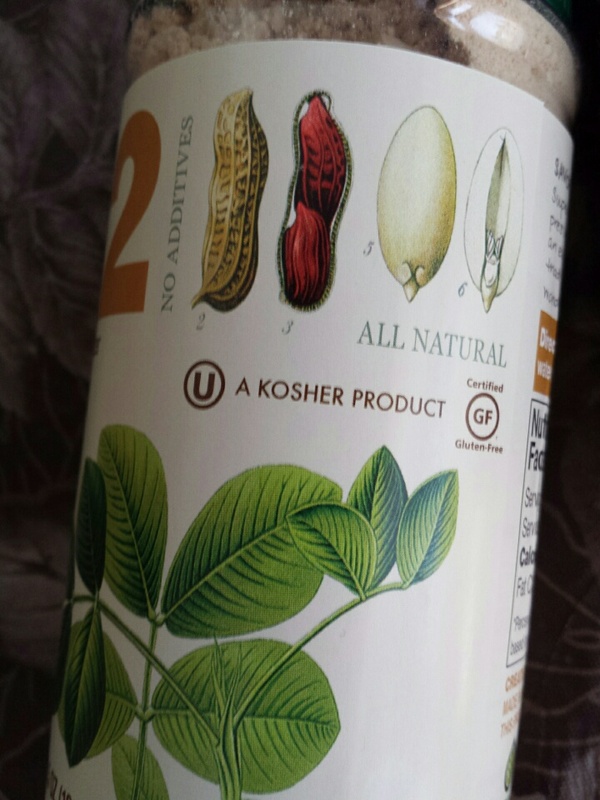 It’s even kosher – pareve. One of the things I love about where I live in rural Maine is that people aren’t just subsistence farmers, they truly care about the quality of the food they eat. A lot of local farmers are using organic farming methods, seeds that are not genetically modified, and heirloom varieties of vegetables. Fruits and vegetables are picked when they are ripe. But the selection can be sparse and the variety limited because of weather. At my current favorite farm I noticed that the kale is always sweet. I don’t know about you, but when I buy kale at the supermarket, it often has a slightly bitter edge. I finally realized it’s because the supermarket kale is probably 3 or 4 days old since the time it was picked. The kale I buy from my local farm was picked that morning. It truly makes a difference when produce is so fresh, not only in taste, but in maximum nutritional benefit. And the eggs! When you crack open an egg from chickens that have plenty of space to roam around and, well, act like chickens, instead of imprisoned in tight confinement and never breathing outside air, you’ll see that their eggs look totally different from what you buy in the supermarket. The egg yolks from a naturally-raised laying hen aren’t pale yellow – – they are a deep marigold yell0w-orange color whose flavor is so rich you will wonder how you could ever possibly think of buying a supermarket egg again. 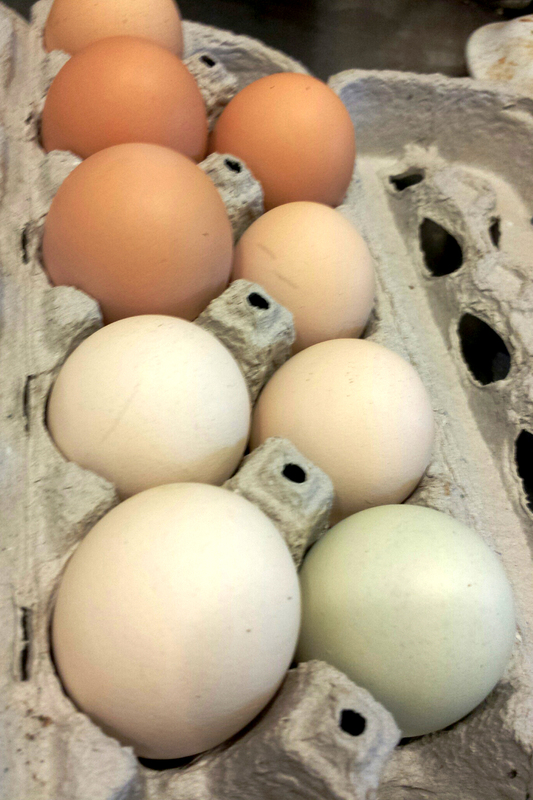 The color of the eggs is determined by the breed of chicken. There are at least 4 breeds of chickens represented by these eggs. 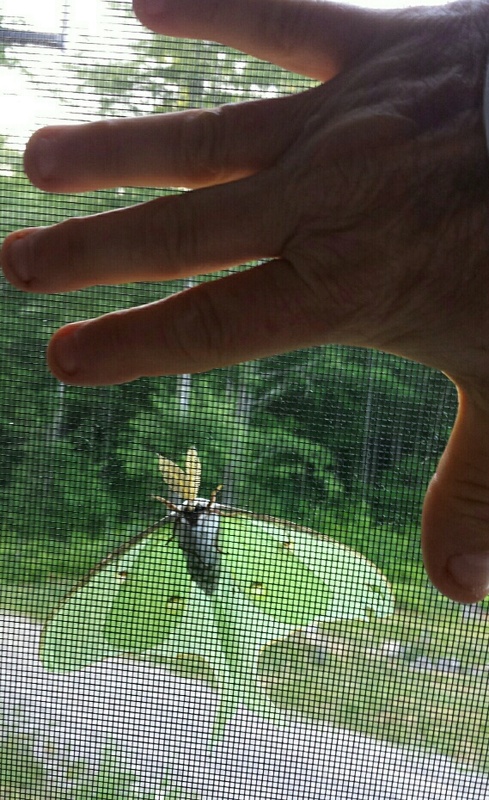 They vary in size as well. But they are uniformly fresh and delicious. What I love about Flyaway Farm is . . . everything. It’s a family farm in the truest sense of the word: a back-to-the-land sort of family, slightly hippie, living very simply off the grid in a remote area, homeschooling their hard-working kids, growing what they need to survive, and selling the surplus for some extra cash. Oh my, do they work hard! There is little respite. 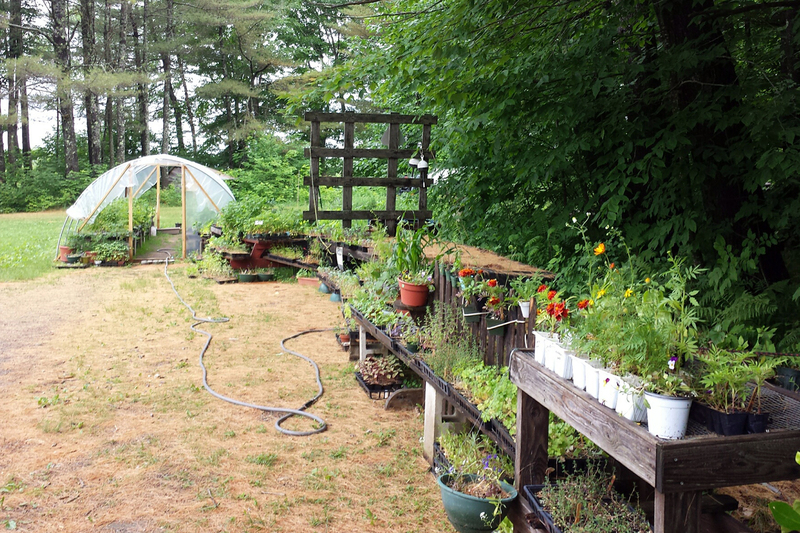 Since they are an organic farm, they are constantly coming up with creative, ingenious ways to thwart the notorious Maine bugs and crop destroyers without the use of toxic pesticides, and improve their soil without the use of chemicals. Like any farmers, they are at the mercy of nature: too much rain or not enough; killer frosts. And still they keep at it, knowing that it’s mostly a losing game but worth the cost because life is good. 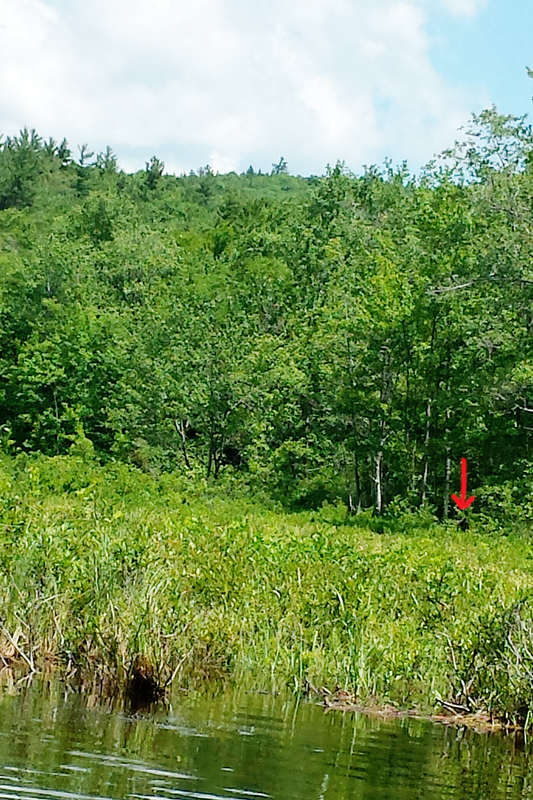 There are a lot of good people in rural Maine who barely get by. Many grow what they need as subsistence farmers and hunt to supplement their food supply. No one wants to be poor, but I can say with conviction that few people in Maine make it their goal in life to be rich. 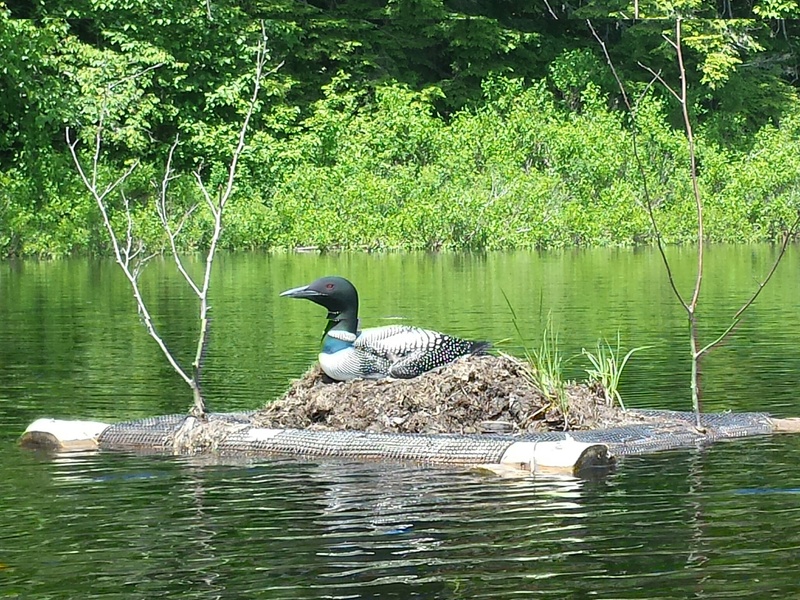 Some would arguably concur that Mainers lack drive or ambition. But most people live in Maine because they want to get away from the rat race, and live slower. It’s hard to do that while wending your way up a corporate ladder. Rural Mainers want to make enough to have the basics and a little left over for an emergency or an occasional splurge, but rural Mainers are the least materialistic people I’ve ever known. Their lives are guided by this question: do I really need it, or do I just want it? Can I make something similar with my own two hands, or from spare parts sitting in the shed/barn? Can I barter for it with something I already have? 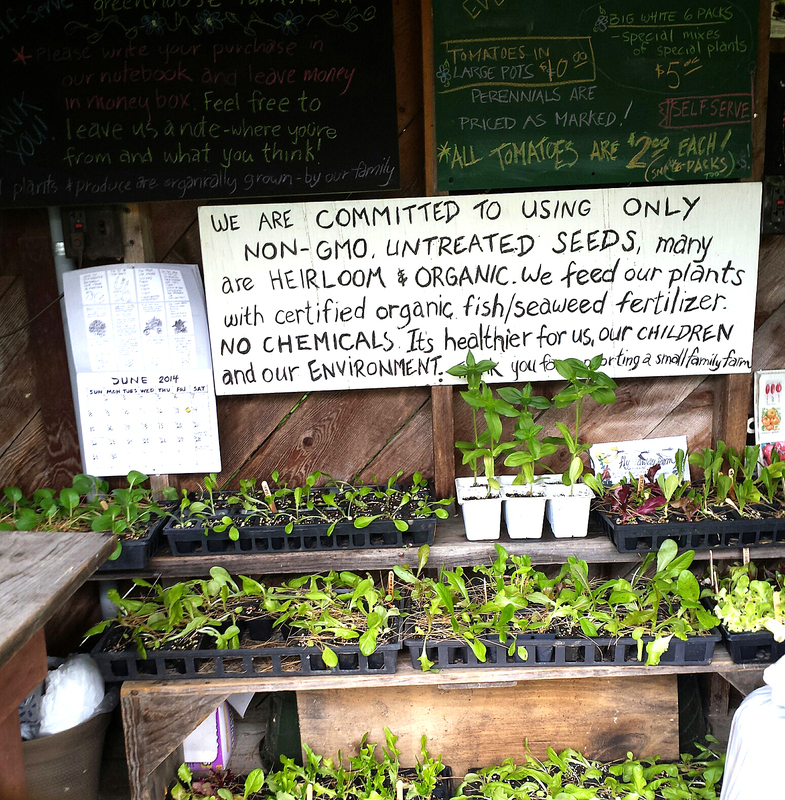 At my local farm, I can also buy seedlings for herbs and vegetables for around $2 per plant. 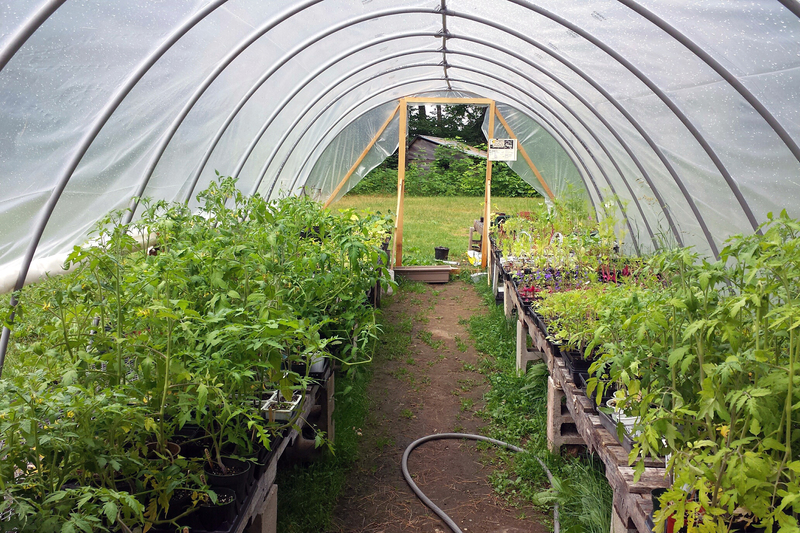 The structure above the seedlings is called a hoop house. 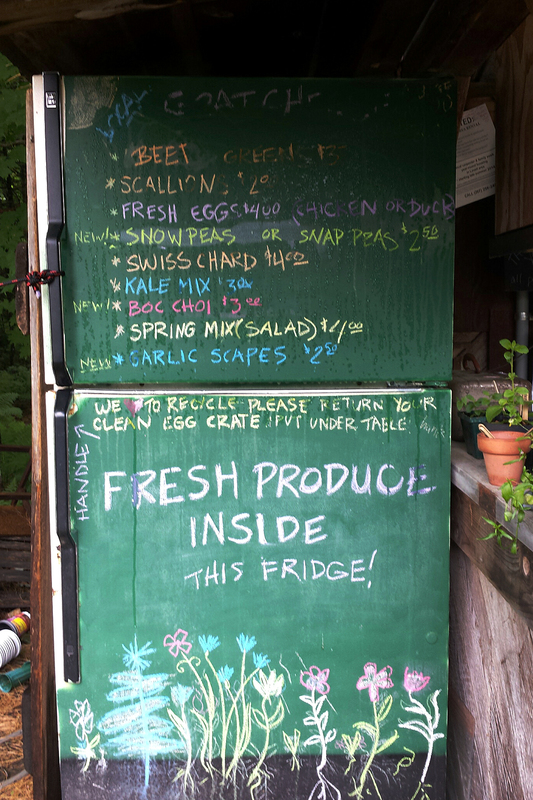 Freshly picked greens are put in bags in the stand’s fridge, waiting for customers. 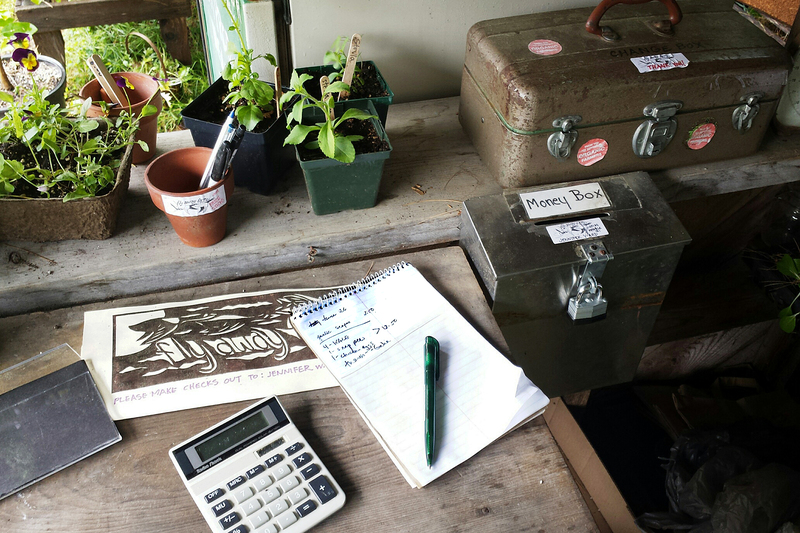 Each week when I buy vegetables, I write down what it is that I’ve taken (this week it was 4 bags of kale, a bag of snap peas, and some fresh eggs gathered that morning from their free-range chickens), and record how much money I’ve paid. The owner is not always at the stand, so I write down what it is I’ve taken and how much I’ve paid. You can see the lock box and change box in the rear right corner. I put the money in a little lock box, although there is another box with about $20 in bills and coins in case I need to make change. It’s all about the honor system and it’s not just a convenience, it’s a creed here in rural Maine. It’s a great and holy thing when you can trust not just your most intimate acquaintances, but the majority of the population, even if they might be strangers. When you live in an environment that is consistent in honesty and decency it changes a person. Life just seems more livable and more meaningful. And soon, you can’t imagine living any other way. The thought of returning to the city, where people are cynical and skeptical and mistrusting, because they’ve been burned more than once and expect to be burned again, is astonishing. Why put up with such ill-begotten behavior if you don’t have to? And you learn that we all make choices, and then wonder why anyone would choose to live in chaos, or get so used to the corruption of certain values that they forget that life can be different in such a positive way. 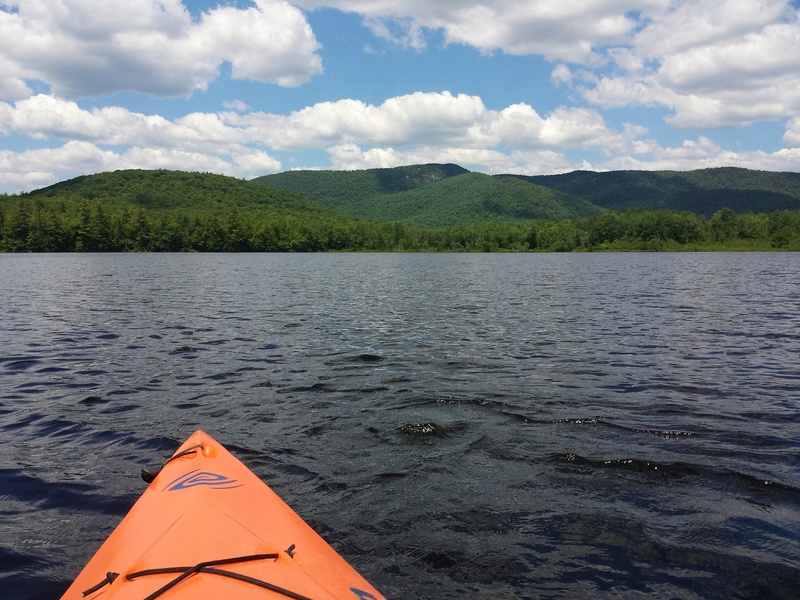 The state motto is, “Maine: The Way Life Should Be.” There is a lot wrong with the state of Maine, but mostly there is a lot that’s right. 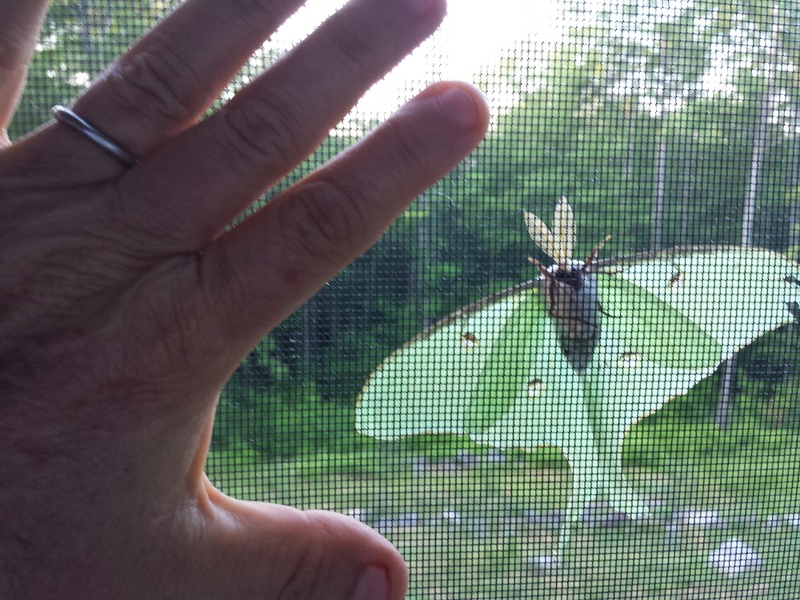 It’s the important things that count: that basic decency and honor and craftsmanship and pride of place that is the very definition of rural Maine, that is sadly lacking in so many other places. The most popular supplier of organic vegetable, herb and flower seeds, bulbs, potatoes, and trees in Maine is Fedco Seeds. That’s where I order my garlic bulbs and they’ve been great. 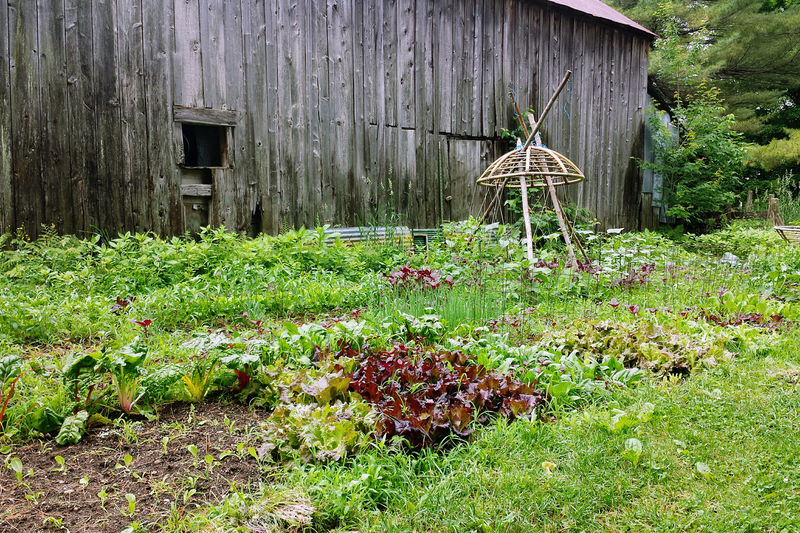 They sell to commercial organic farmers, serious hobbyists, as well as weekend gardeners. You can order a print catalog or just look online. Their catalog has a wealth of information and makes for great reading. They only sell seasonally. I highly recommend them, and they ship all over the US. 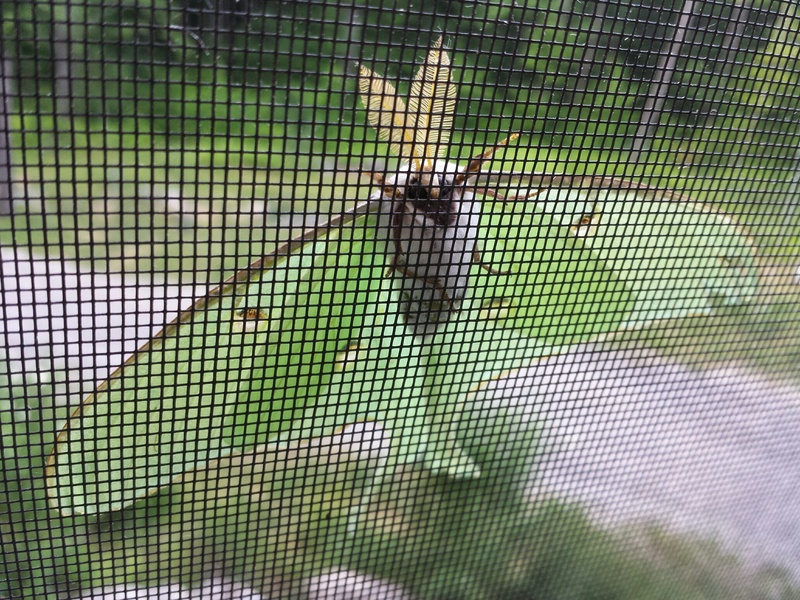 I let it inside a few minutes so I could take a picture of its back. 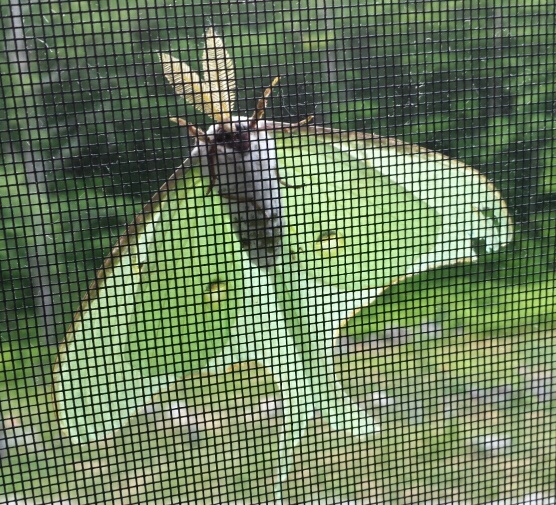 I released it outside immediately afterwards. 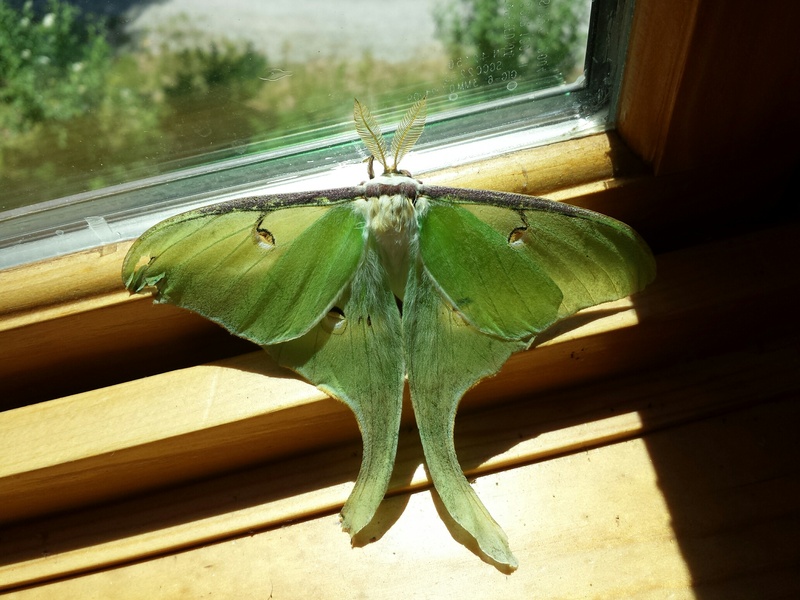 Click on this picture to see the moth in greater detail. 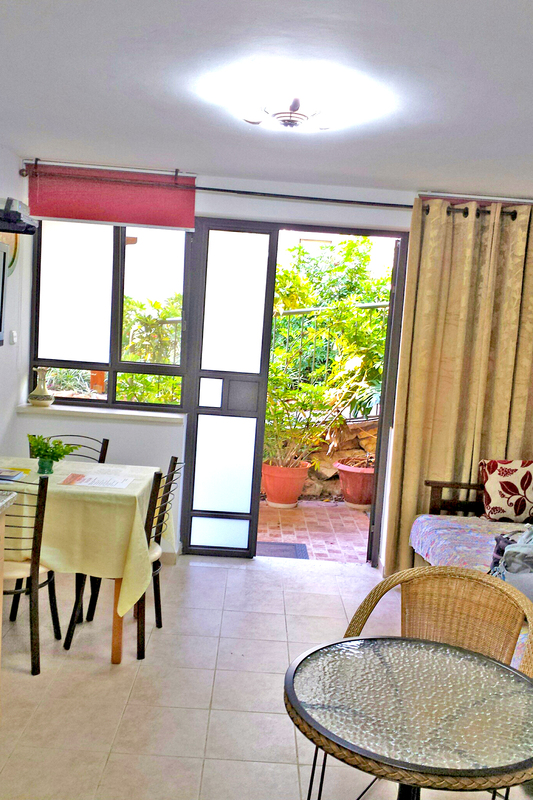 Even though we were completely exhausted after taking the psychometric exam, we had promised good friends who live in Petach Tikva that we’d come for dinner, and we couldn’t disappoint them. How we originally met the “F” family is a story in itself. Many years ago, our eldest son was volunteering for Bikur Cholim, an organization that provides practical as well as emotional support and guidance to people who are hospitalized or seriously ill, as well as their families. At the time, there were several Israelis who were undergoing kidney transplants at an East coast hospital, and since he is fluent in Hebrew, our son volunteered to be of assistance via the Bikur Cholim organization. Although Mr. F’s transplant was successful, he would be unable to return to Israel in time for the Passover holiday. He was in the US with his wife; his children (the youngest was only 9 years old) were staying with relatives in Israel and would have to celebrate this very family-oriented holiday without their parents. Our son asked if we would mind having them as our guests during the Passover holiday; otherwise they’d be staying in a hotel near the hospital and eating alone. Well, as it says in the Passover Haggada, “Let all who are hungry come and eat!” and so they came and stayed with us in our home over Passover. Mr. F (the transplant recipient) was born on the island of Djerba in Tunisia. He emigrated to Israel when he was a small child, but he had a thick Sephardi accent and he spoke a rapid-fire Hebrew, so it took our complete concentration to understand him. Mrs. F was a Cochin Jew from India, having also immigrated to Israel as a small child. Now working as a Hebrew teacher, she enunciated very clearly and we were able to understand everything (in Hebrew) that she said. Although our backgrounds could not have been more different, we quickly became close friends and have remained so to this day. We love the fact that despite our very different backgrounds, the thing that binds us together is our diverse Jewish heritage which meets and melds and binds us as one in the Land of Israel. Every time we’ve visited Israel, we make sure to spend time with the “F’s” where we relive the miracle of Mr. F’s successful kidney transplant and the journey from near-death to a happy, healthy life. Mr. F has lived to walk his daughter down the aisle and recently, experience the joy of becoming a grandfather. While we were at the “F’s” we told them about our quest for a home in Israel. They suggested we take a look at Harish, where their daughter and son-in-law had just bought an apartment. About 15 years ago, Israel built a planned city all at one time, from the ground up, called Modi’in, located in the center of Israel. It’s now a city of 50,000 and prices have quadrupled. In fact, we could not consider Modi’in for ourselves – – it is just not within our budget. But here was a chance to invest in a similar project model. We decided that our last day in Israel, we would check out Harish. 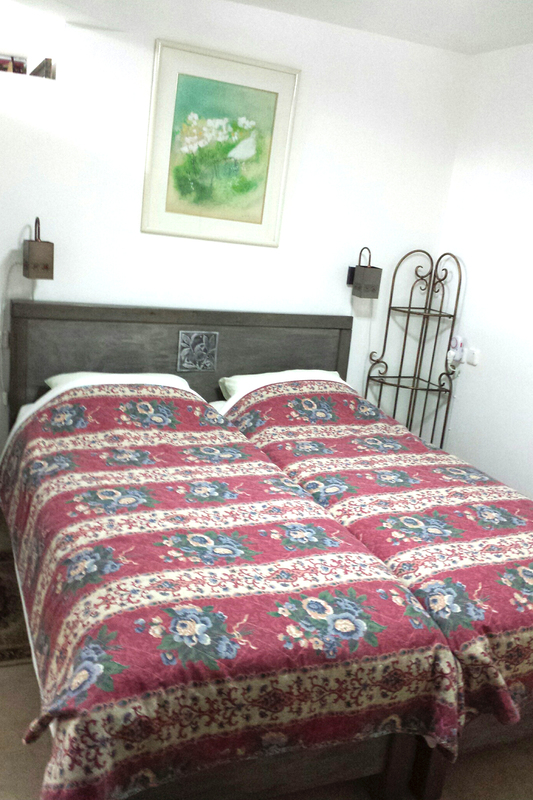 But first, since we were staying in Rehovot, I wanted to visit the town of Mazkeret Batya. 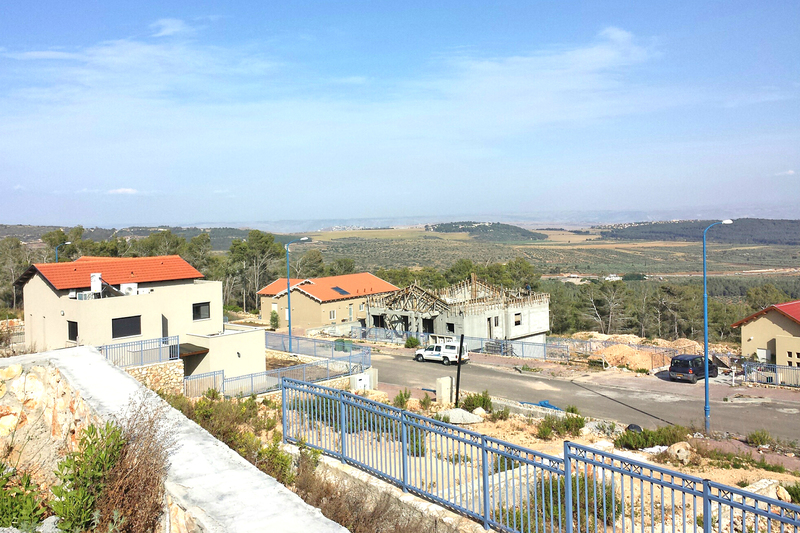 A small village only 3 miles from Rehovot, it was founded in the 1800’s. 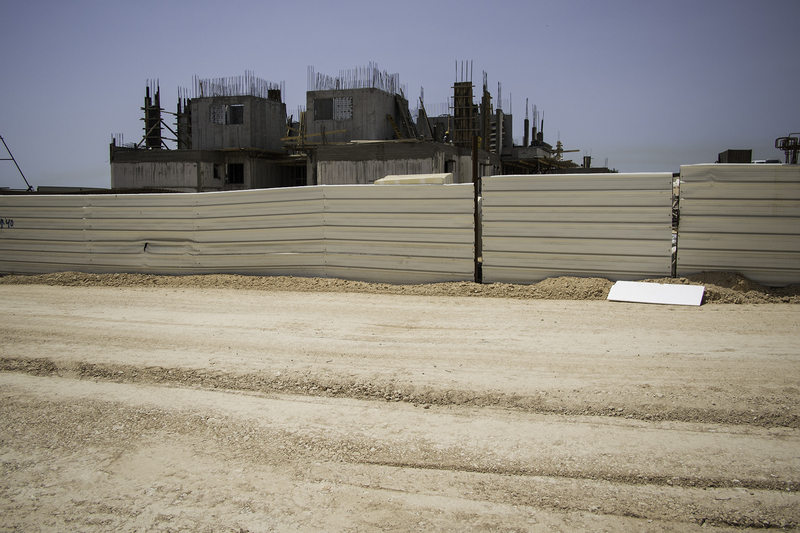 Only recently, on its outskirts, has the village started to expand with new building projects. But the inner core of the village retains its quaint, cobblestoned appearance, with many art galleries, boutique inns, cafes, a delicious bakery, and small museums. What I loved about Mazkeret Batya was that it had the look and feel of Zichron Yaakov, minus the constant arrival and departure of busloads of tourists and schoolchildren on class trips that sometimes turn Zichron Yaakov into a Zionist Disneyland. It’s as if parts of Mazkeret Batya are suspended in time. 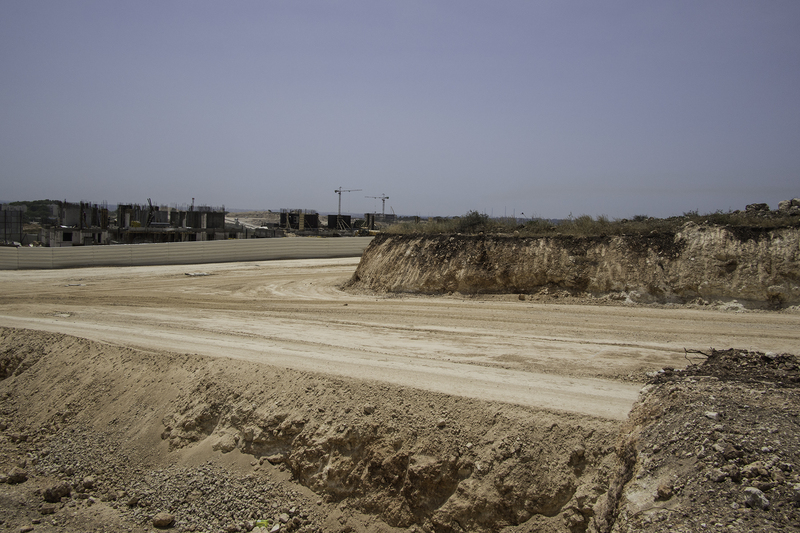 From there we traveled north to the not-yet-built massive pile of dirt that will be the new city of Harish. Just across the road from the town of Pardes Chana, right now there isn’t much to see. 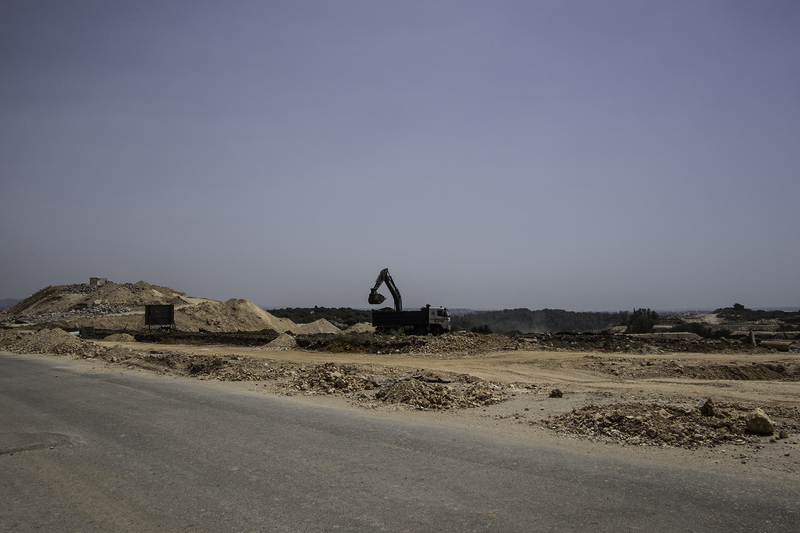 Currently the hilltop that will house Harish is full of monster trucks and excavation trucks. Electricity, sewers, and roads are all being laid out; only a handful of apartments have begun construction. Mostly there is just noise and dust. There is a small lane where several builders have set up offices in modular trailers. There you can see apartment plans and architectural renderings and maps of what Harish will look like not too far into the future. It’s easy to be dubious. But seeing the success of Modi’in from the ground up, there is no reason to believe that Harish will be any different. It will house a population of 25,000. One of the first apartment buildings being built. The block-like rooms seen here are the steel-reinforced “sealed rooms” that are used as both bomb shelters and in the event of chemical warfare. Apartments under construction. Right now there’s lots and lots of dust. 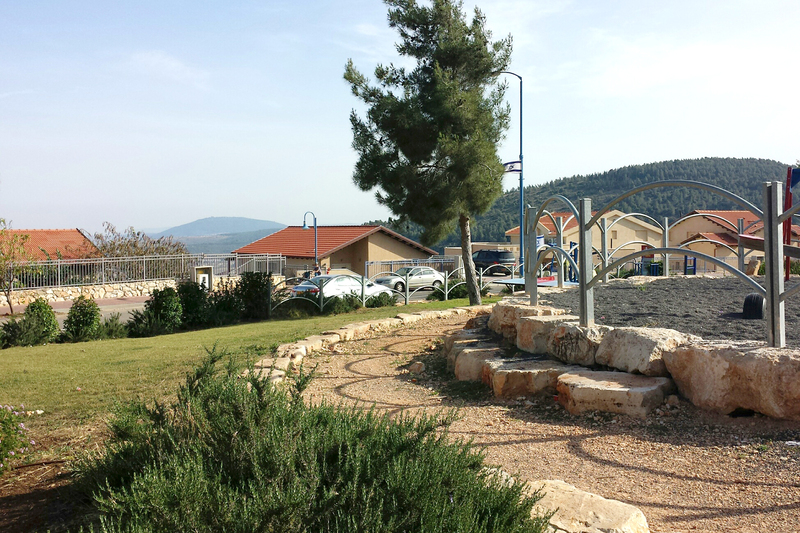 From Harish we went to visit Zichron Yaakov. 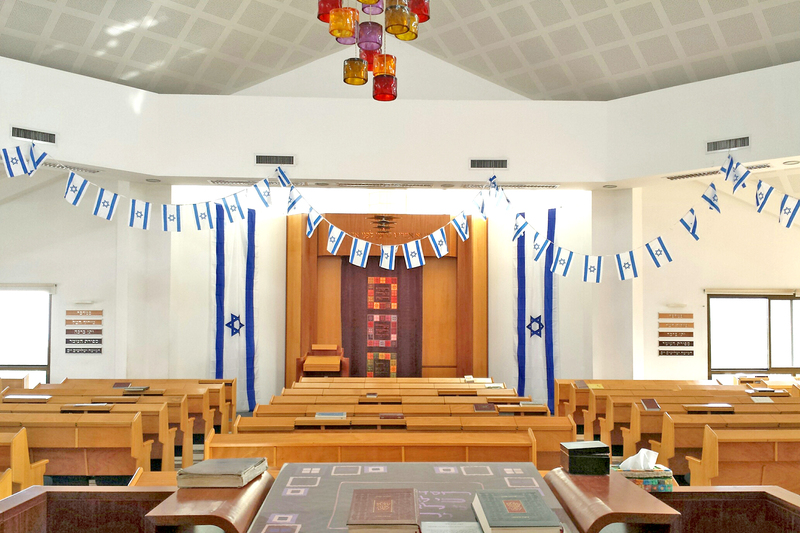 We visited the Baron Hirsch synagogue and were delighted to find ourselves in the middle of a local school’s first grade end-of-the-year performance coinciding with the upcoming celebration of the Jewish holiday of Shavuot (Festival of Weeks), which commemorates the giving of the Torah to the Jewish people on Mt. Sinai (and is also a harvest festival, and it’s when the Book of Ruth is read in the synagogue ). 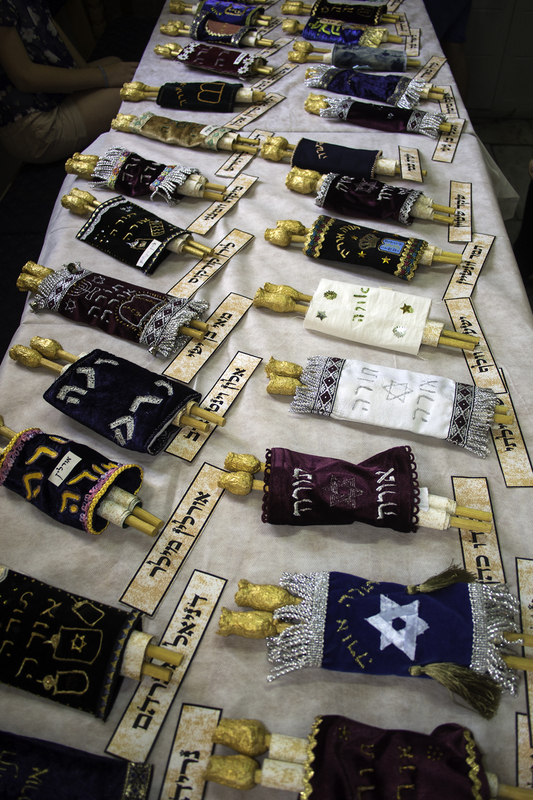 The children were very proud of the little Torahs they had made and decorated. Alas, our trip to Israel was at an end. The next morning we would be traveling via Turkish Air to Boston, and then back to Maine. We saw so much, and would need time to absorb the vast amount of information we gathered. But I think we felt closer to making a decision about where we will make our home, as we contemplate our future and final destiny. 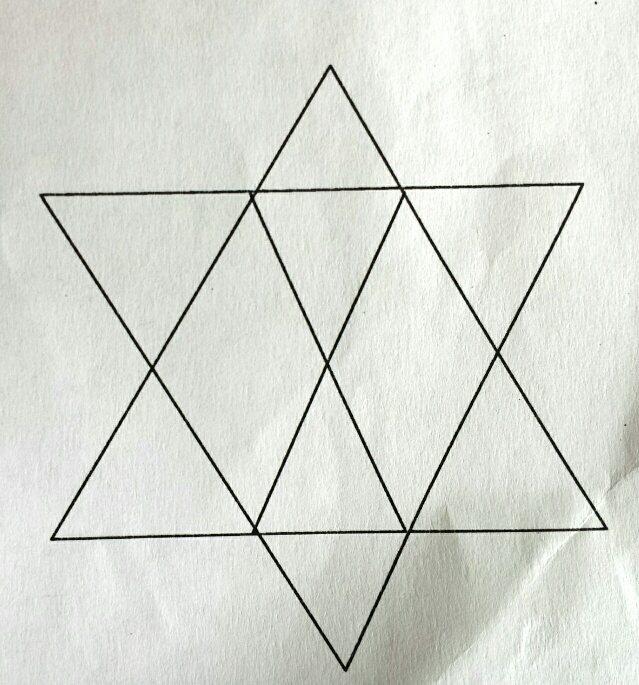 Ah, the infamous Israeli Psychometric Test. In our profound ignorance, we did not realize just how crucial this exam is to determining the average Israeli’s future. There are different types of psychometric tests, depending on their intended audience. Students take the psychometric exam to get into university; and despite top high school grades and top scores on their matriculation exams, if they fail the psychometric test, Israelis won’t get into the university of their choice. You might have a stellar resume, but if you blow the psychometric exam required by your employer, you can forget your job prospects. The army uses similar tests to recruit their top echelon for the elite officers’ corps. Similarly, if you want to join a “closed” or vetted community (yishuv), moshav, or kibbutz, you will be required to take the psychometric exam. I asked both native Israelis and olim (immigrants) what to expect. They sighed, rolled their eyes, and said, “You’ll do fine.” But when I asked them to be more specific about the exam itself, the types of questions asked or the subject matter covered, they just shook their heads. “We’d tell you but we’d have to kill you. You’ll do fine, don’t worry,” they repeated, and so I didn’t give it much more thought. I figured I am a woman in my late fifties; my husband is in his mid-sixties; so how seriously should we take the psychometric exam, anyway? We’re not depending on results to better our lot in life in the job market or in an academic field. 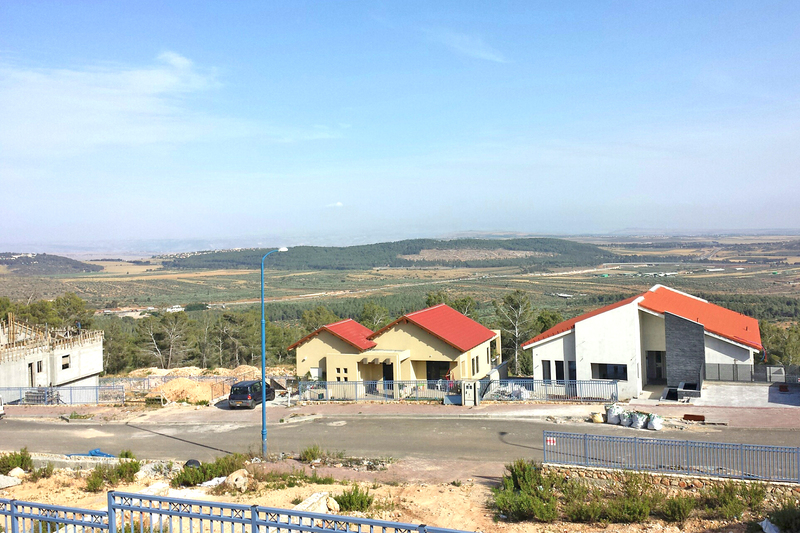 We’d already spent Shabbatot in two communities in Israel that we were interested in. They had interviewed us, had us interact socially with community members and administrators and religious leaders, and things seemed to be going well. Our attitude was that if we were going to get rejected on the basis of our psychometric test results alone, then it probably wasn’t the type of community we’d want, anyhow. Since historically I do not test well, I decided to enter the exam with a fatalistic yet carefree attitude. There was just no point getting anxious over the psychometric exam! I found out only afterward, that Israelis take the psychometric exam very, very seriously. So seriously, that they often sign up for preparatory courses – – some lasting as long as six months! – – on how to achieve good results when taking the psychometric exam, kind of like Americans who take prep courses for the SAT, GRE, LSAT, and MCAT exams. We received one really bad piece of advice from every immigrant we talked to: Since you already speak Hebrew, save yourself the extra $150 cost of taking the exam in English. Especially since even though you are supposed to get the exam in English, much of the test is still in Hebrew anyhow! Well, since the exam was quite expensive in the first place, we certainly were in no mood to pay more for an English version. Our Hebrew may not be great, but it’s good – – good enough, we thought, to save ourselves from paying even more for an English translation of the test. That was our second, biggest mistake. Our psychometric exam was scheduled to begin at 8 a.m. in the center of downtown Tel Aviv. (We found out afterwards that there are also Keinan Sheffi testing centers located in Jerusalem, Haifa, and Be’er Sheva.) There was no way we were going to travel to Tel Aviv in our rental car, handle the traffic and find a parking place, all by 8 a.m. So we stayed with friends in the city of Rehovot (home to the famous Weizmann Institute of Science) and took the train. Like New York, the middle of Tel Aviv is crowded – that’s an understatement – – with loads of everything: noise, traffic, tall buildings, and people rushing somewhere. Everyone is focused only on where they need to go, and getting there on time, rather than the names of actual city streets. Asking directions was futile. When you ask directions of any Israeli living anywhere else in the country, they point in one direction and tell you with utmost confidence, “yashar, yashar!” which means “keep going straight ahead!” even if that is not even remotely correct. Israelis are not doing this to intentionally mislead you; they just want to be helpful and chatty and friendly, even at the expense of being dead wrong. In Tel Aviv, we got the same result as asking for directions elsewhere in Israel – – we weren’t getting anywhere with any kind of accuracy – – but in Tel Aviv, we encountered only blank looks and shrugged shoulders whenever we asked passersby for directions. Finally we found the building of Keinan Shefi Testing Center on a side street, and took an aging elevator to the 5th floor. Miraculously we made it on time, but it was more a case of “hurry up and wait.” There were dozens of people ahead of us. We left our names with the receptionist, paid the 750 NIS test fee (about $200), and were told to be seated until we were called. Around 8:15 we were led into a room with 8 other test-takers and handed a stack of forms to fill out, several pages long, and all in Hebrew. None of the tests were done at computer stations: Israelis also take graphology (handwriting analysis) very seriously. Another segment had 2 pages of little cartoon characters involved in 16 different sticky situations that would make most people upset, alongside another cartoon character with a dialogue bubble above its head. We were supposed to fill in the 2nd cartoon characters’ responses. In this other room we were given yet more forms with test questions. Then we had to do a really strange exercise, also under the clock. We were given a list of 32 words written in Hebrew letters, but they weren’t really Hebrew words. We had to circle those whose definition we understood. I think the idea was to separate the “intellgentsia” from the “chaff”, as well as to see how much exposure one had to the outside world intellectually, academically, scientifically, medically, and journalistically . Many of the words were in fact “trick” questions, as they were close to a real word, but slightly off . . . or was it that it just sounded different in Hebrew? This should have been easy – – after all one is reading mostly English or Latin words transliterated into Hebrew. But reading words that are not Hebrew words in Hebrew letters is a killer for a non-native speaker, since one is struggling phonetically with the Hebrew letters and trying to make sense of it. There were several more tests like these – – I can’t remember all of them, and believe me, memory was a very important part of the day in general as you will soon see in other test examples. After completing this set of exercises, were told to return to the first room and finish up those papers we had been working on. I had written maybe two sentences of my “life story” when we had been called away the first time. Now I had to take extra time to re-read the instructions and review what I had written, so there would be some continuity to my essay answer. But only 3 minutes after resuming writing my life story (I don’t think my husband was even at the life story part yet, he was still sweating over the basic info part of the first questionnaire), we were once again interrupted and told to follow yet another examiner into a different room for a “private” interview. She wanted to probe our relationship as a couple. The psychologist/therapist wanted to know about the quality of our marriage. It’s not that problem marriages don’t exist in yishuvim, but the yishuv did not want people with rocky marriages thinking that moving to a small, closed community would be the panacea for their conflicts. Fortunately we had nothing to hide, and we are clearly in sync. The psychologist’s eyes kept getting wider and wider; she was looking downright alarmed. We smiled at one another. The psychologist looked uncomfortable, and before it got too sappy she ushered us out, back to the first room. Suffice it to say, I think we passed this part of the exam. I re-read the four lines of my life story, and continued writing the saga. But soon enough we were once again interrupted, and instructed to go to yet another room. There, we sat with six other test-takers, including the Russian immigrant, whose Hebrew was better than ours though more thickly accented, and who refused to answer any questions in Hebrew because he had paid extra for the Russian version of the test; a philosophy student hoping to get into grad school; a 60-ish kibbutznik hoping to get an industrial managerial position on his kibbutz; a congenial former naval officer who was applying to be a firefighter; a middle-aged Arab who was applying for a job with an Israeli company; a fellow who was applying for a position as a security guard; my husband and myself. I was the only woman other than the facilitator. We were asked to introduce ourselves by name and tell about ourselves briefly. We were each given an identical piece of paper containing a list of nine imaginary candidates for the Israel Prize (Israel’s top award for Biggest Mensch/Innovator, similar to the Nobel prizes). Each of us was also asked to come up with our own idea of an ideal candidate, and promote his or her contribution to society as being worthy of an award. We were to pick one candidate from the eight personal suggestions invented by each of us, along with two other candidates from the list of nine. There was to be a first, second and third prize, but we all had to agree on the order of the prizes and we had only nine minutes to do so. (One “candidate” on the ” list” was a doctor who discovered a successful cancer treatment; another was a rabbi who helped the poor; yet another was a high-ranking military officer who began an integrative rehabilitation program for disabled soldiers; another was a painter who created a major work of art; another was an educator who worked with underprivileged youth; yet another was a hi-tech innovator who created something bigger and better; another was a person who encouraged Arabs and Israelis to work cooperatively to develop cultural, social and economic ties; etc.). First each person presented their imagined ideal candidate. Then we proceeded to vote on the top three choices from the entire list. Then we attempted to come to an agreement as to which order the prizes would be awarded – – this decision had to be unanimous. We had nine minutes to accomplish the entire process. Aha! Trick question? Should one continue the pattern horizontally – – or perhaps also as a mirror image beneath? She then collected our drawings. Then she had us take out another blank piece of paper, and requested that we re-draw the shapes, this time from memory. Since my own short-term memory skills are poor, I could not remember all the shapes – – but neither could most of the participants, so I didn’t feel too terrible. Fortunately I had not only memorized the shapes, but I had counted the number of repeats, so I was able to re-draw those I remembered with accuracy. We were then instructed to put an “X” inside the center of the main circle, which was about the size of a salad plate. Then we were told to put “x’s” in each of the small circles. 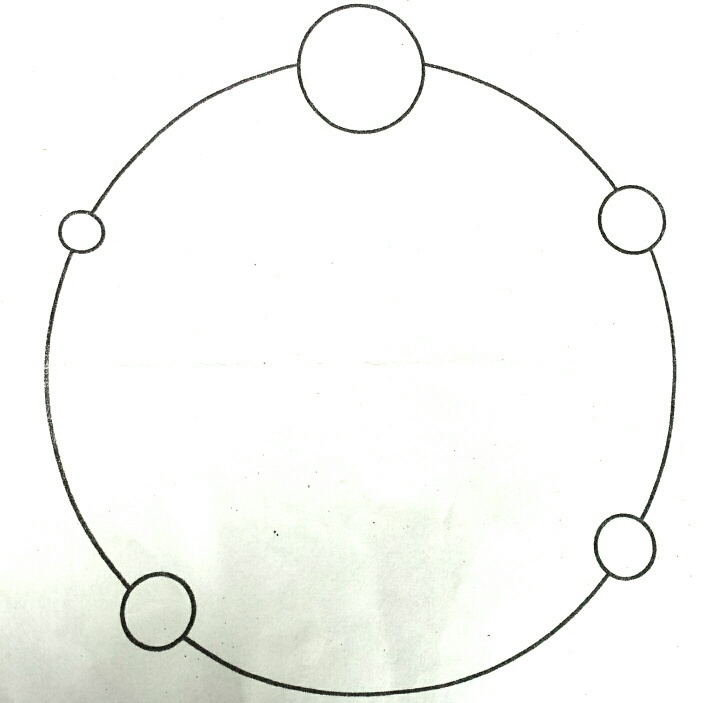 Now we were instructed to close our eyes, and with our eyes closed, to draw an “x” in what we thought was the center of the circle, as well as inside what we thought was the location of the four small outer circles. The results were not particularly impressive. We were allowed to make 3 attempts at this exercise. After the third attempt, we were instructed to write our accuracy rate at each attempt (how many x’s were placed correctly in attempts 1 – 3). Next we were given a test in cryptography. We were given numbers 1 thru 9. Each number had a graphic symbol associated with it. Then we were given a series of numbers and told to place the appropriate symbols next to the numbers. We had to complete the exercise in three minutes or less. This was an exercise in hand-eye coordination, as well as seeing how long it took our brains to process and translate visual information. Then came a very tricky brain teaser. 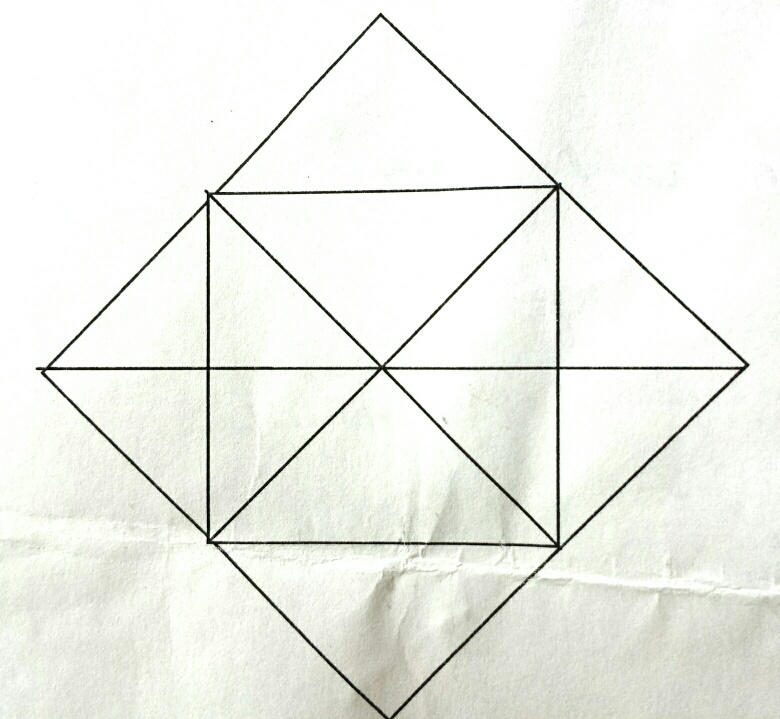 We were given a paper with a series of shapes. 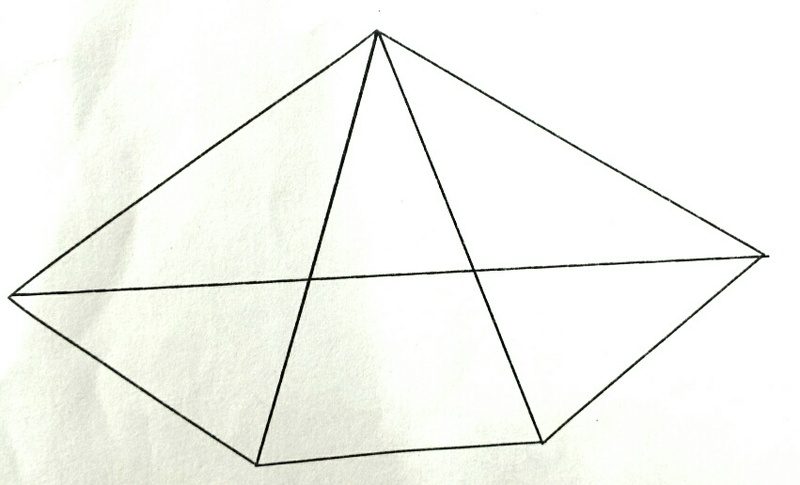 We had to re-draw the shapes, but we weren’t allowed to cross or repeat a line and our pens could not be lifted from the page. If we made a mistake, then we were required to put our pens down and not proceed further with that particular segment of the test. We would have 5 minutes to complete all the shapes. Clearly I did not work well under pressure. Instead of thinking about the exercise logically and thoroughly, I instead grew more concerned with the time limitations, which impeded my rational thought. I only got as far as the third puzzle before I realized I was “stuck” and could go no further. Not only did the exercise require logic and perception, it required planning and forethought and the ability to stay collected and focused under pressure. Let’s just say I am not that person! Once again we were ushered back into the first room; once again we tackled the first set of questionnaires including our life story. Alas, once again we were interrupted and requested to go to another room. I realized that they were also studying our reaction to interruptions – – annoyance, our ability to multi-task, our ability to regain focus, our attitudes, our levels of fatigue. The same eight of us once again were put together in the same room. We were each handed a blank sheet of paper. We were told that we would have to make a cohesive drawing so that the eight papers would fit together as one. 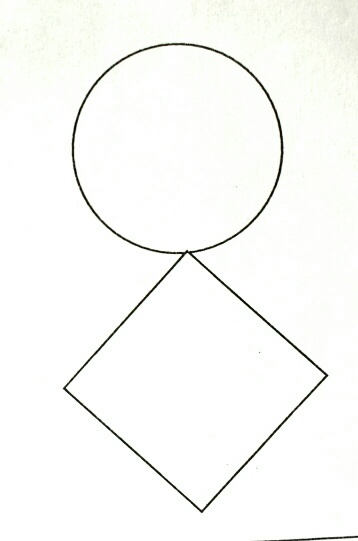 We would be given the topic of the drawing as a single keyword, and have 5 minutes to make the drawing, but after the subject matter of the drawing was announced by the facilitator, we would not be allowed to communicate verbally or via hand motions as to what the drawing should look like or how the picture should be drawn. The main thing was that it should be a cohesive unit from 8 separate papers. We would be allowed to come up with a plan on how to accomplish this before the subject of the drawing would be announced; we could take 10 minutes to discuss it before the exercise would begin. After discussing whether the picture would be vertical or horizontal, in one, two or four rows, we told the facilitator we were ready to begin. Announcing the keyword, “Miracle,” she then clicked the stopwatch and signaled for us to begin. We just looked at one another. I thought of being the initiator and drawing a part of a splitting sea, but before I could act, another participant drew the beginning of a menorah. Despite what should have been a fairly easy concept to carry out (I thought the menorah idea was much better and less complicated than my idea of the splitting of the Red Sea), we were not particularly successful in getting the pages to line up. Actually, it was an epic fail. We were then required to analyze our failure as a team. Finally we were escorted back to the first room to finish up our essay questions and life story. It was now 4:15 p.m. and we had been at this for almost 8 hours (there were bathroom breaks but no lunch break). The Israelis were able to finish up quickly, but we were still breaking our teeth over the Hebrew. We turned to the remaining, final questions. The first page was a picture of a farmer, his back to the observer, plowing a field, with every muscle strained. To the side was a woman, heavy with child, leaning against a tree and gazing off into the distance. In the foreground was a teenaged girl, looking at the observer with a steady, calm and determined look; she was holding a stack of books. We were instructed to compose a story based on what we saw. The next page also requested us to write a story based on what we saw: a blank page. By now I was so exhausted from intense concentration, the many hours of writing and thinking, and the constant struggle with Hebrew reading and writing, that I was nearly slap-happy. I started expounding on what was probably the worst and most clichéd writing of my life: “Life is like a blank page,” it began. The result was so bad I didn’t know whether to laugh or cry. Clearly my brain was shutting down. I quickly finished up my life story, which by now was completely incoherent, disjointed, and sounded nothing like my life. I had been at it for 8.5 hours and simply needed to escape. But my husband was nowhere near done, and was hardly having an easier time of it. My husband is no dummy. He has an advanced graduate degree from a top university and he is a genuine guru when it comes to anything having to do with computer software design, engineering and architecture. He is a very literal, rational, and logical person, but creative thought is not his forté. Any creative writing assignment is a form of torture for him. But a blank page! That was a lot to ask. The examiner collected our papers and glanced at my husband’s final exercise. “Oh, no, this will not do,” she said. “The instructions say that you must write a minimum of ten lines.” About a blank page! He handed the paper to the woman. By now it was 5:15 and he had been at it for nine hours. We were both completely spent to the point of being ga-ga. I had that deer-in-the-headlights look; my husband was nearly catatonic. Riding the train back to Rehovot, we rehashed the experience. My husband felt that the results would be meaningless because of our poor language skills. Instead of writing in an articulate manner, and revealing facts about ourselves in a thoughtful way, our limited Hebrew vocabulary reduced us to the level of fourth graders, with spelling, grammar, and comprehension mistakes that reflected on us very badly. I think I might have actually enjoyed the test had I taken it in English, because I love essay questions which allow room for creative expression. Instead my answers in Hebrew were stilted and canned. But my reaction was completely different from my husband’s. True, we ended up looking like bozos and probably “failed.” But I felt a tremendous sense of accomplishment: I had taken a 9-hour exam completely in Hebrew, and survived to tell the tale! My husband looked at me and rolled his eyes. “You have got to be kidding,” he said. But I knew that if I could do this, I could do anything! Now all we had to do was wait for the results of our tests to be sent to Moreshet and Mitzpe Netofa. 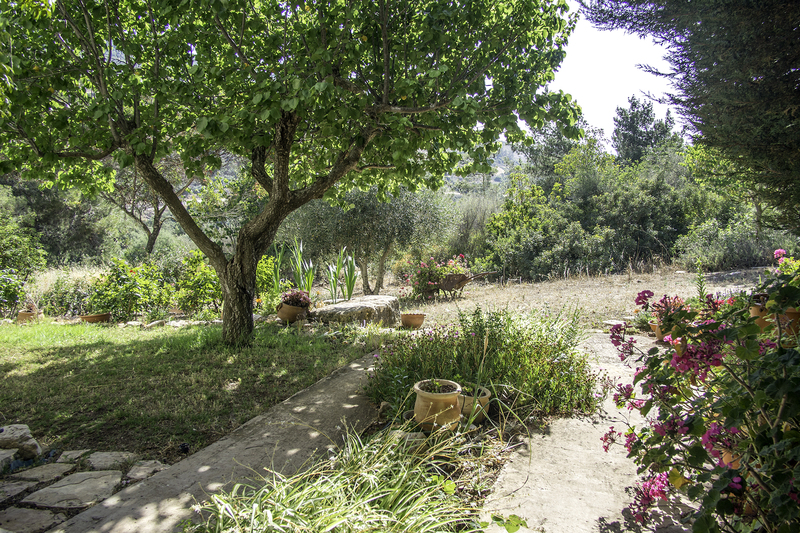 No one could tell us how long it would take before we’d get the results, but we knew it wouldn’t happen before we returned to the U.S.
Our second and final Shabbat in Israel would be spent in the Galilee, in a small yishuv called Mitzpe Netofa. 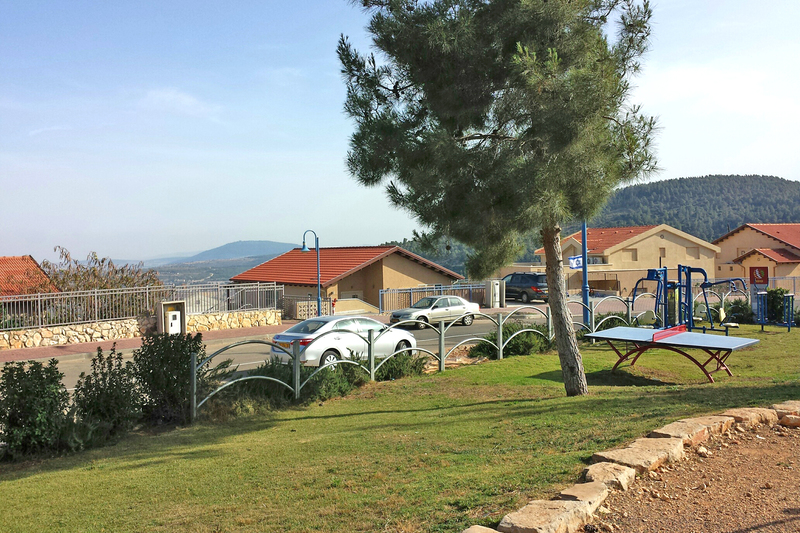 It is located near a major highway crossroads called Tzomet Golani (Golani Junction), from which the highway takes you, depending on which direction you choose, to Tiberias, to the Upper Galil, or the Golan Heights (but still feels out of the way when compared to Highway 6, which runs north to south down the center of the country). Tiberias is only 15 minutes away, but Mitzpe Netofa is high in the hills so it’s quite a bit cooler than Tiberias’ oppressively hot, humid summer weather, and there is always a nice breeze. There is a convenient strip mall, part of “The Big” (pronounced, comically, “Ha-Beeg“) franchise, just off the main highway on the outskirts of Tiberias (downtown Tiberias has yet another, much larger “Big”). 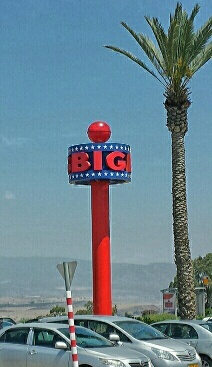 This off-highway “Big” is one of many “Bigs” located throughout Israel. The larger-scale Bigs have many stores which any American will recognize, including The Gap, Banana Republic, Nike, etc. (but this being Israel, clothing and shoes are double the price). It also has a great Rami Levi discount supermarket (a chain found throughout Israel), as well as a wonderful kosher dairy cafe franchise called Cafe Greg, that served one of the best vegetarian meals I’ve ever eaten. 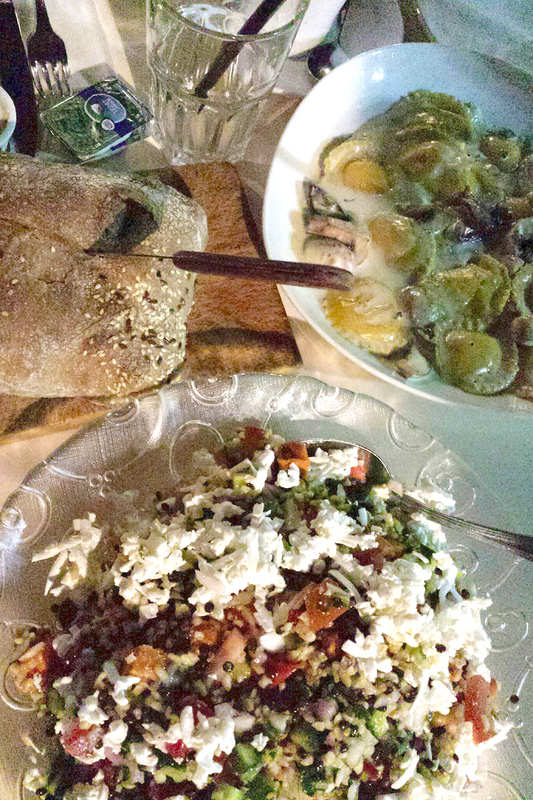 A delicious vegetarian meal of handmade spinach and sweet potato ravioli, with a feta and goat cheese, lentil, bulgur and edamame salad, served with crusty artisan bread. It meant that if we lived in Mitzpe Netofa, we wouldn’t have to rely solely on the local macolet (mini-market) with its limited selection, since the Rami Levi supermarket chains are big, beautiful, well-stocked and fairly priced, and this one was only 15 minutes away. 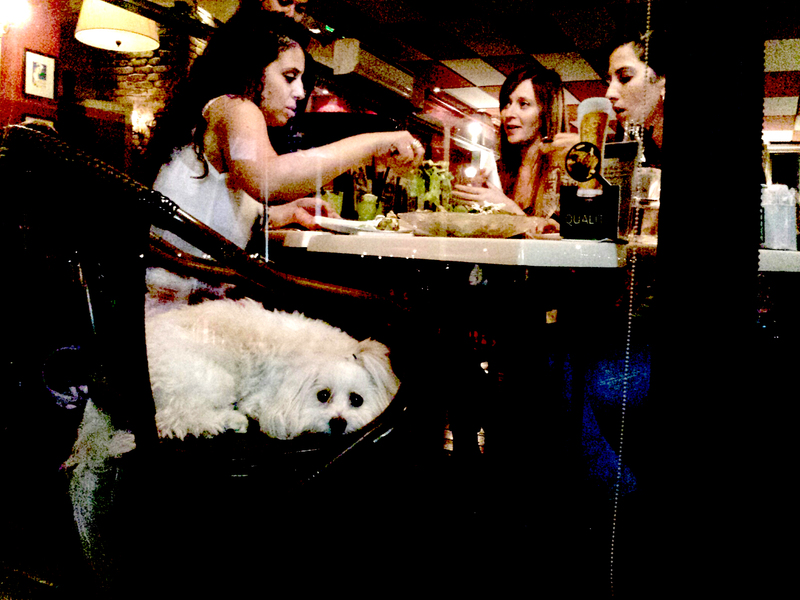 I also enjoyed people-watching there: there were some Druz couples out on dates, plenty of Israeli youth, and families all enjoying the food and ambience. Until now we had been eating on the cheap: besides my beloved Milky puddings and Choco drinks, we were subsisting on fresh pita and humus bought at convenience stores because due to our extensive driving schedule, other than the shwarma in Jerusalem, we hadn’t even had time to sit and eat at a restaurant, so the delicious meal of incredibly fresh salad with local feta cheese, and handmade spinach and sweet potato ravioli with goat cheese along with a cold Tuborg beer that we enjoyed at Cafe Greg, was especially appreciated. There were several things about Mitzpe Netofa that appealed to us. First, there is absolutely no age discrimination. There are plenty of people our age, but of course there are many young families as well. What is impressive is that the various age groups seemed to mix; they greeted one another with genuine affection and interacted socially in one another’s homes. Everyone we saw came up to us and greeted us in a friendly manner, really going out of their way to make us feel welcome. At the synagogue on Friday night, during the announcements, our names were mentioned as visitors and we were publicly welcomed by the entire congregation. The main synagogue is located in the main, original area of Mitzpe Netofa. 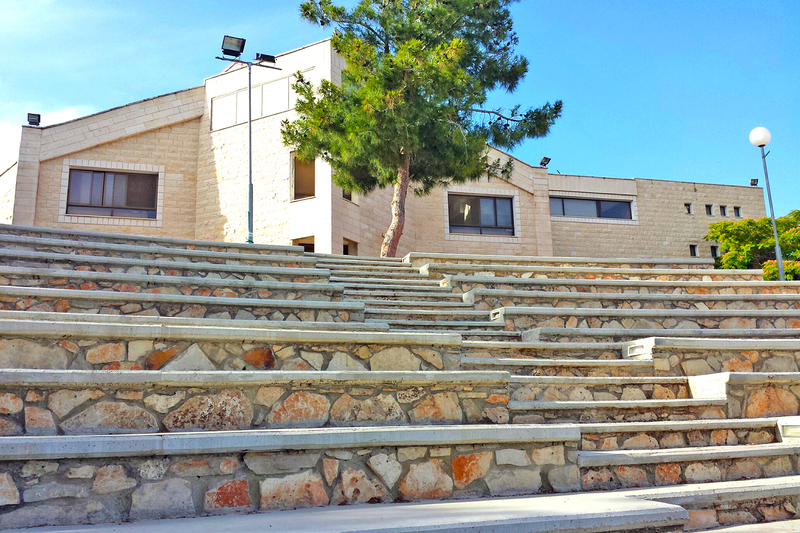 Just outside the synagogue is an amphitheatre which serves as a great meeting spot and is perfect for community concerts and performances. The newer building area is in a completely different location one hillside away, which is a bit of a shlep (not a problem for me, as I love to walk). There is a possibility that a Sephardi syngagogue will eventually be built to service the new neighborhood. But for ourselves, it probably makes more sense for us to buy an already-built (and rarely available!) home in the 15-year-old neighborhood, since as we age a long, uphill walk may be impractical. 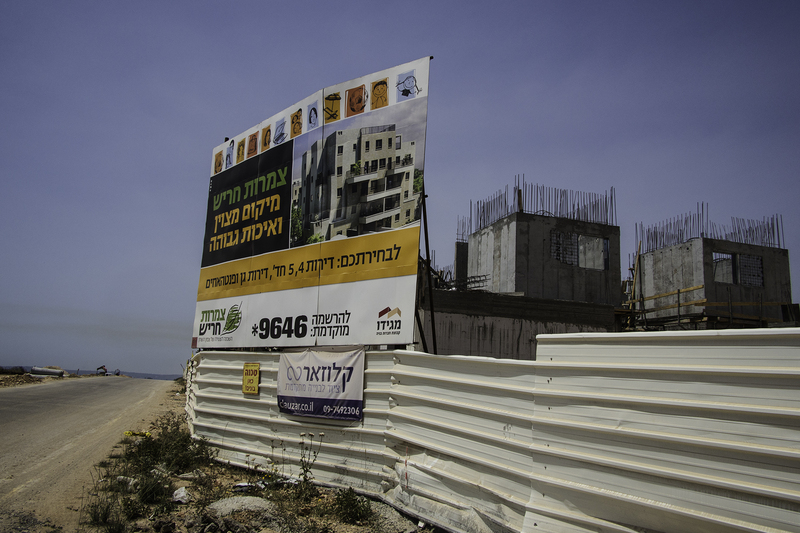 Most of the “older” residents – – those who had been in Mitzpe Netofa for 15 years – – live in the older neighborhood, with young couples with small children buying in the newest areas. Mitzpe Netofa, in conjunction with Nefesh B’Nefesh aliyah organization (a key administrator in NBN lives in Mitzpe Netofa), has a rather unique program called the Soft Landing Program. In order to not only encourage aliyah to Mitzpe Netofa but also to the North part of Israel in general, they have a “try before you buy” program at Mitzpe Netofa. This is not an option for acceptance – – the one year probationary period is a requirement for acceptance/membership/permanent residence. One rents a “caravilla” (very basic modular prefab home) for the highly subsidized price of 1000 NIS approx for 3 bedroom caravilla to 1500 NIS approx for 4 room caravilla per month for a minimum of one year (As of this writing $1 = 3.4 NIS’ or put differently, 1 NIS = $.29). During that time, you participate in all aspects of life in Mitzpe Netofa, with the exception of voting rights on community issues. 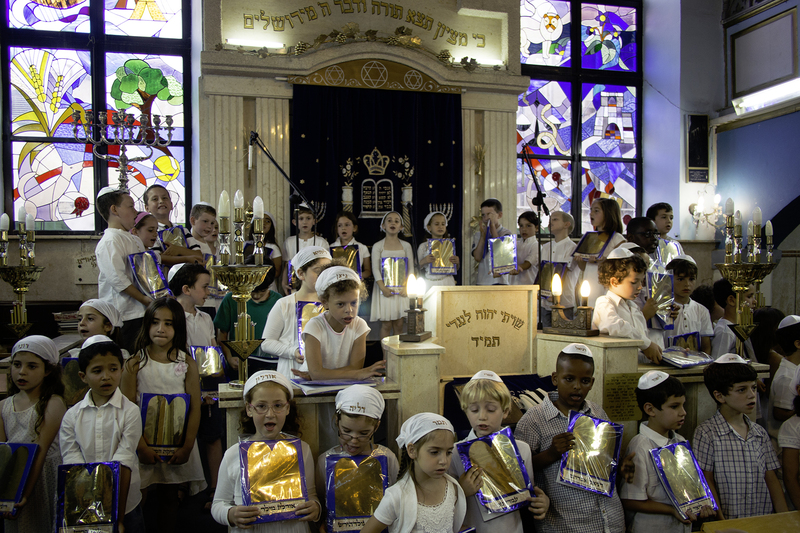 During that time, one’s children (if applicable) attend local schools; one is a member of the synagogue; one participates in any extracurricular activities offered by the community; one makes use of the medical clinic if necessary, one interacts socially and gets to know the residents, etc. The community meanwhile does its utmost during that initial try-out year to make potential residents feel welcome, inviting them as guests on Shabbat, befriending them, including them in participatory activities, etc. It’s a way of getting one’s feet wet – – a sort of baptism by fire – – without burning one’s bridges if things don’t work out. Interestingly, there is no particular pressure to join Mitzpe Netofa itself. 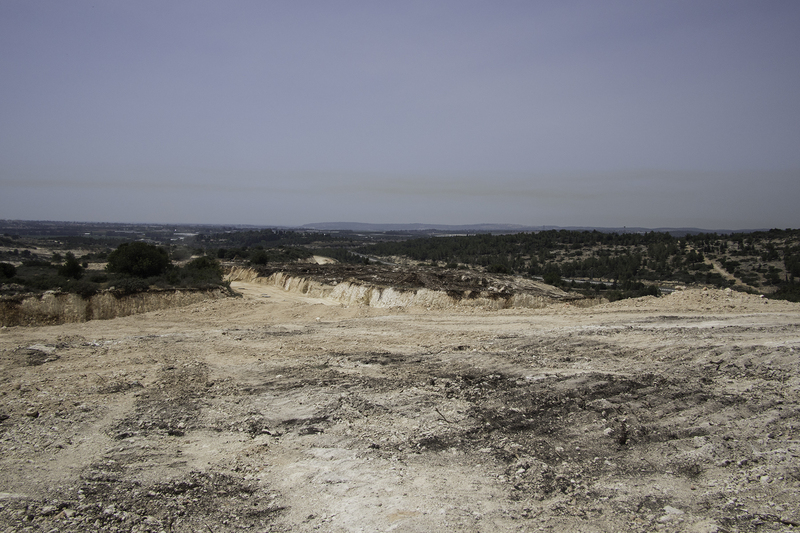 The real purpose of the Soft Landing Program is to use Mitzpe Netofa as a base for further exploration of the Galilee, whether it’s towns or cities or smaller villages, moshavim, or yishuvim. 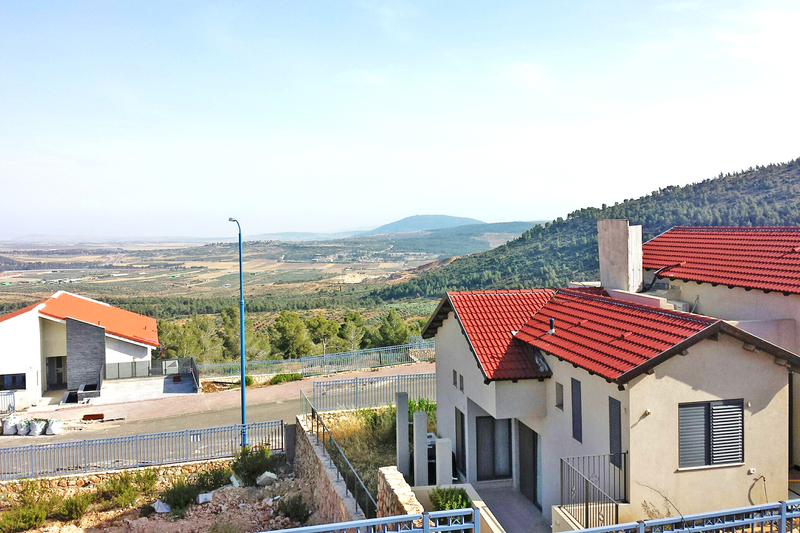 The point is to attract new inhabitants to the Galilee/Golan region. Less than 50% of the people in the Soft Landing Program end up living in Mitzpe Netofa, yet the program organizers don’t consider this a failure, as the reasons for leaving are diverse. 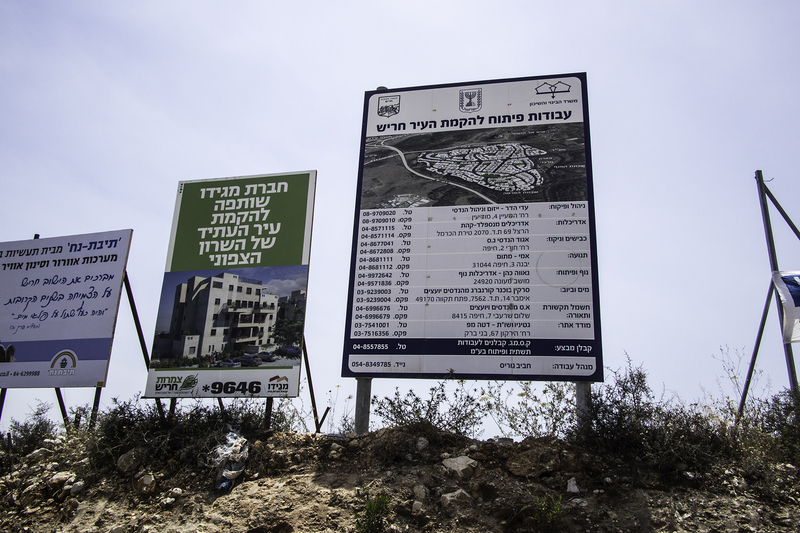 If someone is going to be very unhappy at Mitzpe Netofa, it’s better for all concerned to realize it’s not a good match before they’ve committed to building a house. One person I spoke with who was leaving who had really enjoyed living in Mitzpe Netofa looked for a job in the North but simply couldn’t find anything within commuting distance (they will be moving to Modi’in in central Israel after he got a job in hi-tech in Tel Aviv). Another person realized they didn’t enjoy living in such a rural, small place and moved to Ma’alot, a beautiful city of 25,000 people near the Lebanese border. Yet another tried to find work and was unsuccessful, and with broken spirit returned to the US (but these yordim assured me that had they found work and not exhausted their savings, they would have stayed, because they loved the residents and lifestyle in Mitzpe Netofa). So what’s the downside of the Soft Landing Program? Practically speaking, based on our observations, the caravillas were poorly maintained. They’re hot in the summer and cold in the winter (no insulation); because they are rented and maintenance is the responsibility of the tenant, the yards are unfortunately completely overgrown with weeds and they have a generally neglected appearance. Their location is next to the youth organization clubhouse, which is extremely noisy when meetings and gatherings take place, sometimes late on Friday night. The majority of residents in the caravillas are very young families, with no immediate neighbors in our age range. In short – – and yes, I’m spoiled! – – I don’t feel like I have the patience or desire to live like this, especially when this one-year “temporary” housing often stretches to 3 – 5 years (one person we spoke with had been living in their caravilla for 7 years!) while waiting for a building lot to become available. (All building lots in the current phase are sold out; the next building phase, which will not take place for at least 2 years, is also sold out.) I am also afraid that if we rent for many years, we will go through savings that could have been applied to a permanent home. There is an alternative to living in a caravilla while undergoing the probationary period for acceptance, but it’s a more costly one: renting a whole house or basement apartment from someone who has temporarily left Mitzpe Netofa (i.e. doing a fellowship abroad, doing work for the Jewish Agency or other non-profits abroad, etc.). I am afraid that if we end up renting for many years, though, we will go through savings that will compromise our ability to buy or build a permanent home. We met a lovely British couple who are our age that made aliyah a year ago, who are experiencing exactly this (remember what I said about age discrimination in Israel – – it is extremely difficult to find work if you make aliyah in your 50s and 60s). And of course, if the owners of the rental house return, one is forced to look for new housing and move yet again. But at least there seemed to be a precedent for older olim and wannabe Mitzpe Netofa residents to experience the Soft Landing Program outside of the usual caravilla framework. 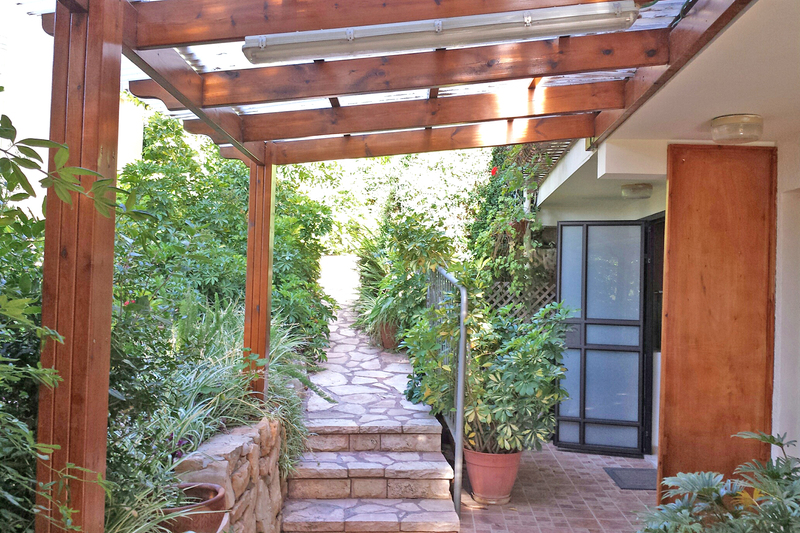 We rented a zimmer in Mitzpe Netofa which was really nice; it led to a beautiful, private garden. 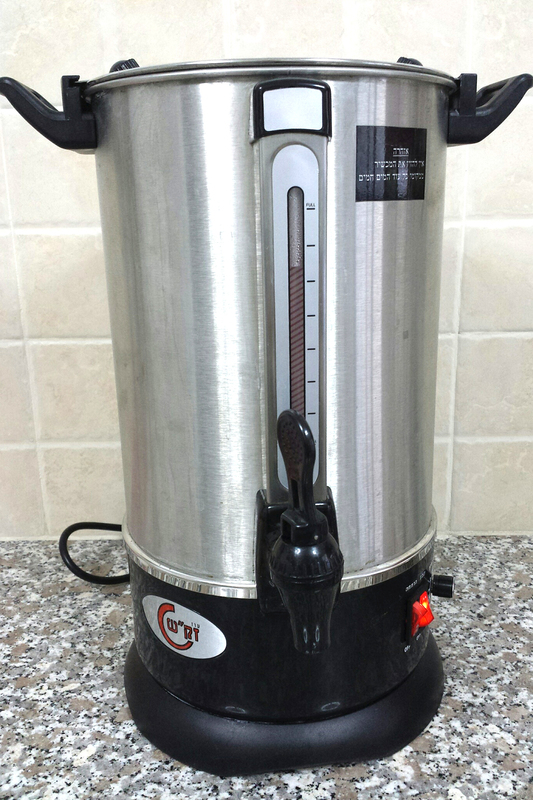 It had every amenity, including a Shabbat hot water urn, instant coffee, cake, and milk in the small refrigerator. 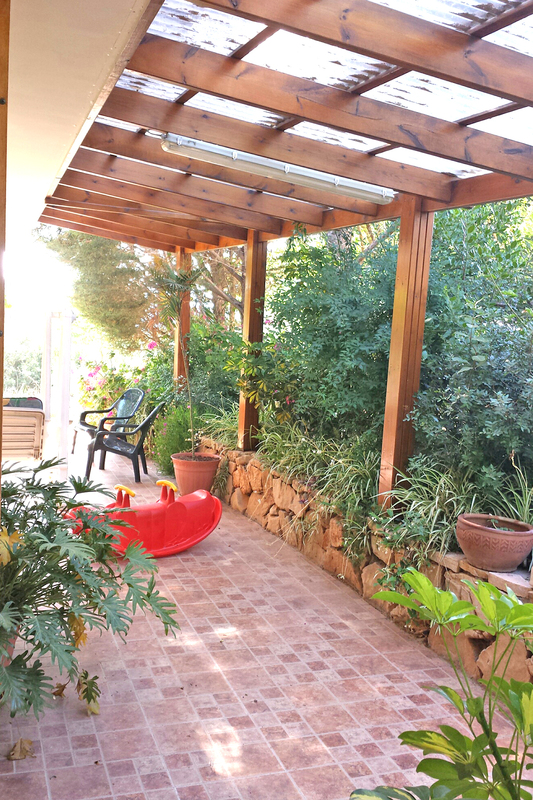 It was owned by a lovely woman who had built her dream house in Mitzpe Netofa 17 years ago with her husband; but shortly after its completion he was tragically felled by a terminal illness. She converted the lower level of her house to a series of beautiful apartments that are used as zimmers and which provide her with an income. There was a printed piece of paper left on the counter by Mitzpe Netofa’s Aliyah Committee with our “Shabbat itinerary” telling us the names of the families where we’d be eating our Shabbat meals. This gave us the opportunity to get to know both “Anglo” and Israeli families living in Mitzpe Netofa, and allowed us to ask many questions and address any concerns. We met many unique and outstanding individuals with fascinating stories to tell. The residents of Mitzpe Netofa have diverse occupations. I met teachers; youth leaders; an archaeologist; a librarian; a retired plastic surgeon who is now a successful sculptor; a farmer; a computer guru who was involved with several start-ups and interested in my husband’s work experience; an employee of Raphael (Israel’s top secret weapons developer); and the retired military commander of the entire North, who lives in Mitzpe Netofa as well. 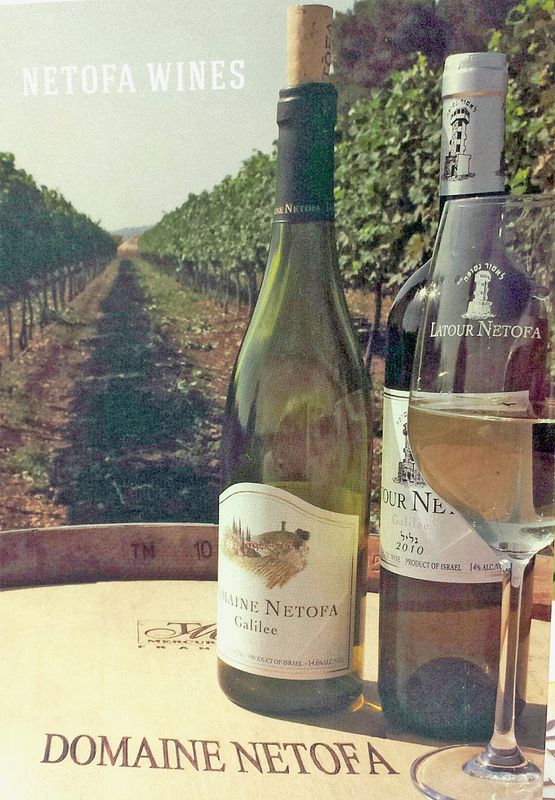 There is also a vintner whose wine is sold around the world (Domaine Netofa Winery); his grapes are grown in the Galilee and the Golan Heights, about 45 minutes away. The particular Shabbat we visited they had invited a guest singer, a Modhitzer chassid, to lead the prayers. This was most defnitely not a usual event, since the yishuv is neither chassidic nor chareidi, and the usual chants are sung in more au courant tunes than those delivered by the chassid. That said, I thought it spoke well of the yishuv that it attempts to expose its members to different cultures within cultures. It’s part of Mitzpe Netofa’s philosophy to get exposure to an “other,” and respect and celebrate differences and foster cooperation. (They even have a karate club with the nearby Arab village. An Arab teacher teaches karate to the Jewish boys, and the Arab boys are taught by a Jewish teacher. 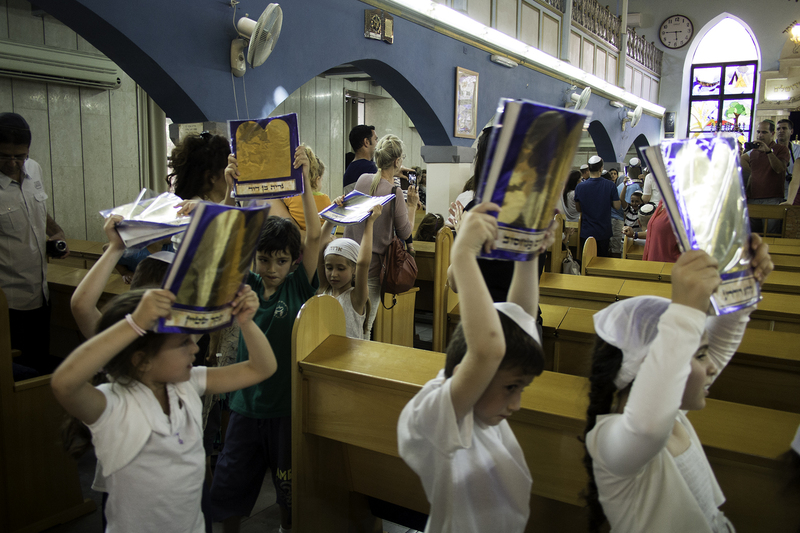 These are everyday stories of daily life in Israel that you won’t hear about in the news.) There were also many religious classes offered throughout the week in both Hebrew and English, by resident rabbis and female scholars as well as those who came from other towns to teach. When Shabbat was over, we met privately with the rabbi of Mitzpe Netofa, a very young and gentle scholar who clearly loved the residents and whose admiration was definitely mutual. One thing I appreciated was his honesty. After discussing the many positive traits of Mitzpe Netofa, he didn’t whitewash the challenges and mentioned some of the issues affecting the community. That said, Mitzpe Netofa is a very non-judgmental sort of place, with residents respecting each other’s differences, which greatly appealed to us. 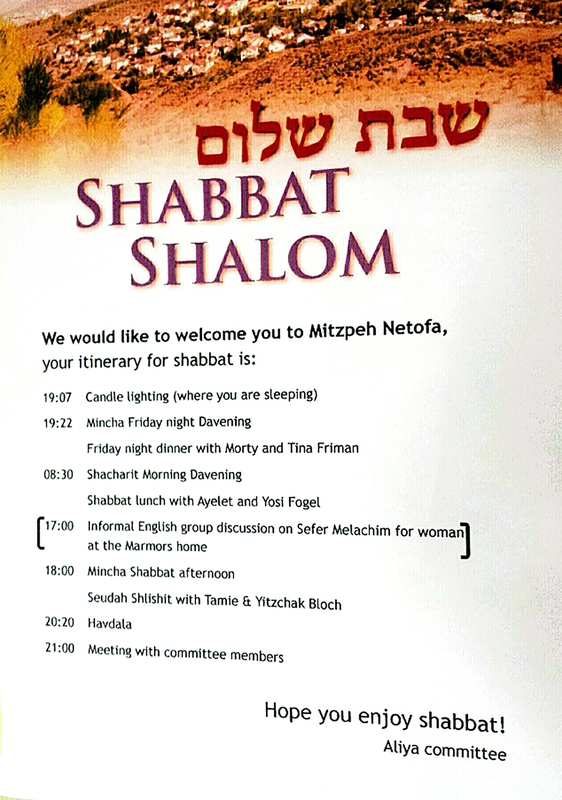 I felt that Mitzpe Netofa was not nearly as selective or exclusive as Moreshet in choosing their future members. Yet their required Soft Landing program accomplished the same thing in weeding people out, because only someone with tremendous commitment and patience would agree to live under temporary circumstances for so lengthy a period. We decided the best decision was to make no immediate decision at all, at least until we had more pieces of the application process complete. We decided to go ahead with our application process for both Moreshet and Mitzpe Netofa, because we wanted to do whatever was necessary to fulfill the prerequisites to get the long process of absorption and acceptance into motion. We would still be required by both places to take the dreaded Israeli psychometric exam, and acceptance to either place would hinge greatly on the results of this test. Our feeling was this: if we got accepted by a yishuv, great; if we didn’t “pass” the battery of tests, then it simply wasn’t meant to be. We would not be disappointed, because we felt that we wanted to go only where we were wanted and accepted. If living in a small, closed community was not an option, then so be it – – we would instead look at small towns or cities on a future pilot trip. The main thing is to be flexible and remain open to a variety of possibilities, of which there are many. Perhaps a yishuv was the wrong option for us altogether, since we’d have to add in the huge, necessary expense of owning a car, and in a city we wouldn’t need to own a car and would be closer to a major medical facility as we age (that is something that is very hard for me to think about as it is not my reality at present, thank G-d). So much to think about! Whatever we decide, we want it to be the correct decision; we are too old and too tired to be living like “wandering Jews” once we get to Israel. Meanwhile, we booked an appointment with the Keinan Shefi Institute Testing Center in the center of Tel Aviv, to take place two days before we were scheduled to depart Israel, so we could get the required psychometric exam out of the way. Little did we know what we were getting into! It would prove to be the biggest “adventure” of our entire trip to Israel . . .